This post goes briefly through my journey of becoming a connected educator and describes how being connected has affected my work in education. It was written as part of the #blogsync for October 2014 in connection with Connected Educator Month. In my early days of teaching in many ways, to use a bit of a cliche, “I didn’t know what I didn’t know”. I wanted to improve my practice—I had a lot to learn—but I didn’t have a lot of people to turn to for help. I had some great colleagues and a fantastic PRT co-ordinator (shout out to you Leigh! ), but the people I could go for help, advice and ideas was limited. I could connect a bit more through PD courses that I went on, but to be honest, I wasn’t very good at connecting. Roll forward a few years to 2009. I was at a PD course where the facilitator talked about using Twitter. Now, my first thoughts of Twitter was, “why do I care that some random person has gone for a coffee?” That’s what I thought Twitter was about. The presenter, however, said to use Twitter with a purpose. Follow like-minded people that share content that you are interested in. Follow hashtags that are relevant to you. So I signed up and started following a few educators and found there was some interesting things shared. I started blogging about the same time and shared these on Twitter and started to develop a little bit of an audience. I even heard from the creator of a web app I had blogged about who thanked me for the blog post and let me know of some upcoming features. I thought this was pretty cool! It probably wasn’t until Ulearn 2010 that things really started getting interesting for me though. Not only did I being to see how the use of a hashtag at a conference could begin some good discussions with other attendees, but for the first time I had actually seen a keynote speaker engage with participants also. Ulearn 2010 was also my first time blogging about a conference and through Twitter I had that keynote speaker, Steve Wheeler, retweet one of my posts. How good did that make me feel! Since then Steve and I have had the odd brief twitter chat (not sure many have been particularly education focused) but a connection was made. From then on my blogging became slightly more regular (well… I had regular patches!) and my tweeting continued to grow as well as the connections I was making. Fast-forward three more years and it was another Ulearn—2013—that these twitter connections really started to make an impact. Leading up to the conference I noticed someone (the amazing Barb) was organising a twitter dinner so thought I’d bite the bullet, step out of my comfort zone and join in. It was amazing to meet these people I had only known by their twitter handle face-to-face. So I met a few at the dinner and a number more throughout the conference. Strange to meet people like Annemarie Hyde and realising we knew quite a lot about each other (maybe we share to much on Twitter! ), however I now consider her a good friend! 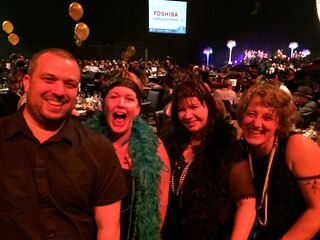 Reconnecting with many of them at Ulearn14 and again at the Twitter dinner was just amazing. Who would’ve thought 10-15 years ago that so many people would meet each other through online means. Hasn’t that always been considered dangerous?! Yet now we’re probably doing it more than ever! As an educator, being connected has opened up a new world. As I said at the start, in my early days of being a teacher my world for learning was limited to those I could get around me either at school or at a PD course. Now though, I can connect with experts either that I work with or someone who could be on the other side of the world simply by sending a 140 character tweet! It seems so informal, and is! But there are many people that want to learn with us and want to share with us. And I truly believe everyone has something to share, they just have to be willing to share it. What might seem like a small thing to you could be the gem that another teacher needs to work through something in their class; to find new ways to engage their students; or be encouraged to try something new and change their practice. While many of us might still teach in single-celled classrooms where no-one else sees what is going on, online connections give opportunities for the world to be opened up. But we must allow it. We need to be willing to learn from others—our colleagues, our students, even others from outside of education! We also need to be willing to reflect on and share our own practice in order to become better educators. So why should we connect? It’s not about us but about our students! The simple answer is that we owe it to our students and to their future to continue to learn. Connecting with other educators online gives us the opportunity to learn at all times about anything! Online connections allow us to build support networks that we might not have in our own situations. Online connections break down the walls of classrooms and schools and remove the oceans that separate us. They enable us to learn together to improve our practice for the benefit of our students! For Connected Educator Month this year I thought it would be good to step out of my comfort zone a little and present a short webinar with someone I’ve never met before! So I contacted Alex Le Long (@ariaporo22) a few weeks ago and asked if she was interested to present on blogging. She was! Step one complete. We had a quick Google Hangout where we talked for the first time ever virtually (other than through Twitter) and semi-planned out the session. There might have been a slight “wing it” attitude from both of us but we were a bit more prepared than that. Step two complete. Stepping out a bit further we decided to run a Hangout on Air. I’ve used Adobe Connect a lot to run training sessions etc, but hadn’t actually used Hangouts on Air, so whether this was a good idea or not we were going to find out! In the end it seemed to work okay except that it seemed that the audience that we knew were there weren’t really a part of the session except through the odd question in the Q&A panel. All in all it was an interesting experience and the recording of the session is available on YouTube (and embedded at the end of this blog post). What did I learn? It’s good to try something new and once again step out of our comfort zone. Google Hangouts might not be the best “webinar” tool but it is definitely usable. And it’s fun to do something with someone you’ve only met through Twitter! I’m looking forward to meeting Alex during the next few days at Ulearn in Rotorua! If you want to watch the webinar, here it is.